One established problem with curcumin is that it does not easily dissolve in water and it is this feature of the compound that is believed to significantly limit the amount that can be absorbed from our digestive systems. For this reason Lamberts have carefully selected a turmeric extract with ‘enhanced absorption’. 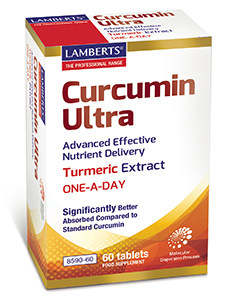 Lamberts® Curcumin Ultra contains CurcuWIN® which is manufactured utilising proprietary UltraSOL™ technology. This is a molecular dispersion process that enhances the bioavailability of poorly absorbed nutrients and increases water dispersibility of fat soluble ingredients such as curcumin. Importantly, this product provides the curcuminoids in the same profile as they are naturally found in turmeric. A technically advanced turmeric extract 46 times better absorbed compared to standard curcumin Produced using a sophisticated molecular dispersion process Provides a full 100mg of curcuminoids The curcuminoids are in the same profile as they are naturally found in turmeric. An orange coated oval tablet. Tableted With: Bulking Agents: DiCalcium Phosphate, TriCalcium Phosphate and Povidine, Crosslinked Cellulose Gum, Antioxidant: Mixed Tocopherols, Anti-caking Agents: Magnesium Stearate & Silicon Dioxide, Glazing Agents: Hydroxypropyl Methylcellulose & Hydroxypropyl Cellulose, Colours: Titanium Dioxide & Riboflavin, Polypropylene Glycol. See presentation section for ingredients listed in bold. The following list of allergens are excluded: Wheat, Gluten, Barley, Soya, Eggs, Milk and milk products, Lactose, Nuts, Sulphites, Celery, Fish, Shellfish and Yeast. To be stored in a cool, dry place and protected from light. Legal Category Food supplement.